Best Buy Co., Inc. has admitted to maintaining two versions of its website - with different prices. One is the public website accessible on the internet by anyone; the other site (essentially a replica of the public site) could only be accessed inside of Best Buy stores. Both sites were nearly identical, except for one important difference: the in-store site displayed the in-store (typically higher) price for products. This other site -- the fake version of its public website for internal use at its stores -- is allegedly a scam to rip off consumers. Best Buy lists cheap product prices online and invites customers to its stores to purchase them. However, when the customer arrives at the store, a salesperson finds the item on the fake website and shows the consumer that the price has gone up. Then the customer can buy the item at this new, inflated price. The problem occurs when a customer is told that they are being shown the public Web site when in reality they are being shown an intrastore site. This misrepresentation causes them to pay a higher price because they are not given the price-matched discount. Best Buy, also known as the 'big blue box', is a Fortune 100 company and the largest specialty retailer of consumer electronics in the US and Canada, accounting for 17 % of the market. It was named "Company of the Year" by Forbes magazine in 2004 but there's not much chance of it getting any further awards if Best Buy is found guilty of fraud. Many customers have gone to Best Buy after seeing a cheap price listed online, only to find that the in-store price is higher. Often when a customer raises the discrepancy with a Best Buy salesperson, the customer is shown the internal website which lists the product at the higher in-store price. One former employee said that managers and other employees encourage salespeople to use the higher price on the internal Web site. 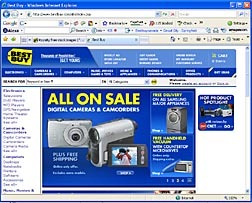 State Attorney General Richard Blumenthal ordered the investigation into Best Buy's practices on February 9th, 2007, after it was disclosed that employees at two Connecticut stores denied customers a $150 discount that was advertised on BestBuy.com, but not on the in-store computer. The Connecticut Attorney General's Office is investigating Best Buy to determine whether the two websites were created as legitimate tools for store associates and there was confusion as a result of insufficient training, or a deliberate attempt to perpetrate a fraud on the public. If you have purchased a product from Best Buy and paid the higher in-store price for a product that had a lower price on Best Buy's website, you should consider contacting an attorney. The attorney general of Connecticut has filed a lawsuit against Best Buy Co., Inc. alleging the company pulled a bait-and-switch and overcharged customers, using a website scamto do so. Jeri Prince is one consumer who does her homework. She regularly shops around for the best deals, and thought she had the best deal in her sights when she found the appliances she wanted advertised at Best Buy. If you have purchased products at Best Buy based on prices seen on their in-store website, please click the link below to send your complaint to a lawyer to evaluate your claim at no cost or obligation. On January 19th of 2017 I was contacted by a Nina Clark saying that Best Buy had a civil lawsuit against me for non payment of a bill and a contract I signed. I don't have any credit cards through Best buy and as far as I know I have not out standing bills from best Buy and had not received and letters or notification. How do I find out if this was a scam?